This beautiful gothic building used to be dedicated to Saint Christopher, until the unfinished statue of the Madonna made by a local sculptor and located in his orchard ('Orto') was discovered to be working miracles. The statue was transported to the church in 1377, where it remains to this day, in the sacristy, and the Church became known to locals as the 'Madonna Dell'Orto'. The facade and the statues (St Christopher, the Madonna and the Angel of the Annunciation over the door, the 12 apostles in niches) are by Bartolomeo Bon. 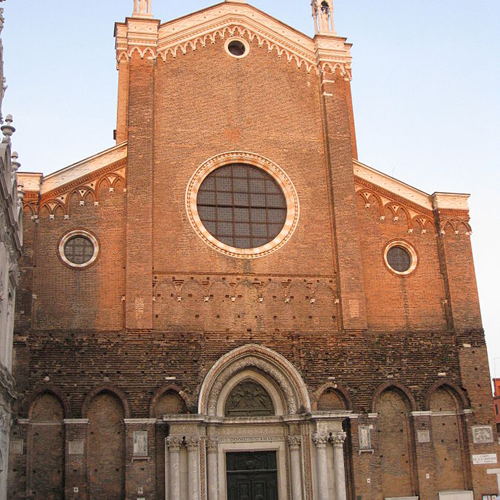 The church is best known today for being the parish church of Tintoretto, who was commissioned to decorate it over a period of several years, and who is buried here by the main altar. The Tintoretto works here are truly magnificent and will brighten up your whole day - this style of monumental artistic decoration of church was new to Venice at Tintoretto's time, and his work here influenced the churches around Venice to commission ever more elaborate art. This used to be the most popular church on the Chorus programme, at about 35,000 visitors (still only a tenth of the visitors to the Accademia or St Mark's), but it is no longer in the Chorus organisation. It still gets plenty of visitors, despite being slightly out of the way, and no wonder - it's a haven for some of the best works in Venice. That's despite the abominable theft of an original Bellini in 1993. 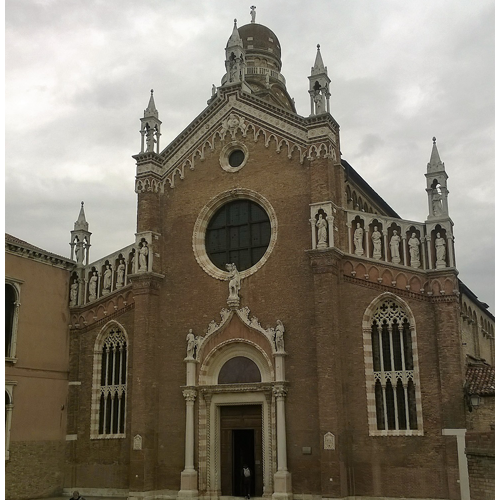 Pordenone considered his 'St Lorenzo', painted for this church, to be his best work; but it's now in the Accademia. Completed twenty or so years after Michelangelo's magnificent Last Judgement in the Sistine Chapel, this Last Judgment depicts the event as a flood, and the piece shows clearly how Tintoretto was inspired by the Florentine master. It's not clear if Tintoretto travelled to Rome to see the work first hand - for he rarely left Venice; but it's likely that he at least saw sketches of it. In fact, Tintoretto was known to be a fan of MIchelangelo - he drew several versions of the 'Day' and 'Night' figures that MIchelangelo sculpted for the Medici Chapel in San Lorenzo in Florence - some of these sketches are now held in the Louvre, but if you look about halfway up the painting, to the right-hand side, you'll see a figure in an orange loin-cloth, clearly identifiable as Michelangelo's 'Day'. At the top of the canvas is Christ with the sword and lily of mercy, being advised by Mary and John the Baptist. I have told the story of Raphael and Tobias in the entry on Angelo Raffaele, in case you're unfamiliar with it. This painting was moved here from the Church of San Marziale, its original location as described in Vasari's Lives. It is considerably older than the Tintoretto paintings in the church, dating from around 1515. In the grove you see St John the Baptist. The painting is considered to be in the style of Giorgione - it was painted when Titian was around thirty. Cardinal Gasparo Contarini was a prominent figure in Venice - known for writing a treatise on the laws of the Republic and he had lived along the street from the Madonna Dell'Orto from birth. After his death his family arranged for him to be buried here and they sponsored the reconstruction of this chapel to the honour of St Agnes. Busts of the Contarini family line the walls. The saint's relics are documented to have been in the church since at least 1542 - Agnes was a Roman who refused to marry the son of a prominent noble - the noble gave Agnes the choice between marrying or being exposed naked in public. She refused to marry and was miraculously clothed by an angel, while her young suitor was strangled by the devil - this is the figure lying on the lower left of the painting. His father, shown here in red, then pleaded with Agnes to intervene to save his son, and her prayers brought him back to life. Unfortunately for Agnes, she was then sentenced to death as a witch, and had to be stabbed when the flames refused to burn her. The painting is remarkable because it is compressing the events - her clothing, the death of her suitor and his resurrection into a single image. Tintoretto painted this, along with the 'Last Judgement' at cost price - some say this was to gain from the prominence that the commission afforded him - others suggest that it was as penance for offending a cardinal... At the top you can see Moses receiving the tablet of the Law, while at the bottom the collection of funds to build the Golden Calf is ongoing - a clay version has already been constructed. I'm always struck when looking at this by how inappropriate Paul's armour is to the frail older man we see kneeling beside it. This piece was restored by Save Venice in 1999, and they have done a wonderful job - there are only four Cima altarpieces in their original position and frames, and this is one. According to Save Venice, the work is painted on poplar wood - nine panels glued and fastened together - and it's painted using a mix of tempera paint and the oil paint that would have been relatively new to Venice at that time. The other figures present are Saints Peter, Mark, Jerome and Paul .The red of the robe of St Jerome is oil paint, and the sky is an unusual mix of the very expensive lapis lazuli blue and a much cheaper azurite (copper ore) paint. The painting was completed, as the shield in the base of the frame suggests, for the Saraceno dal Zio family, who were wealthy spice merchants. Seeing as it is still in the original location, it's noteworthy how Cima has painted the light to match the light sources in the church - John the Baptist looks off towards the light coming in from the window in the facade. John Ruskin was a fan of Cima's, and he wrote of this piece "the whole picture [is] full of peace, and intense faith and hope, and deep joy in light of sky, and fruit and flower and weed of earth". Ruskin also notes that Cima was excellent at painting John the Baptist (some critics say that this figure is based on Donatello's wooden statue in the Frari). and reminds us that this affinity is unsurprising as Cima's name is, of course, Giovanni Battista. This was once on the back of the organ doors of the church, along with the Decapitation of St Paul - the front featured the Presentation of the Virgin. As the organ has since been dismantled, we can now enjoy all three works at the same time. My wife says that this is her favourite Tintoretto - she loves the way the young girl Mary is striding confidently towards the Temple elder - no sign of fear in the young girl's face or gait. I have to say I agree with her - I love the golden tones that are Tintoretto's trademark. The steps are styled like those in the inner courtyard of the Doge's palace and the whole scene could easily be of a Doge receiving a guest in 16th century Venice. One of Palma's better works - it's somewhat surprising that he occupies the position over the main altar of Tintoretto's parish church!